A virtuoso piano recital exploring the roots of American music. “Rags, Blues, and All That Jazz!” has been performed to wide acclaim extensively throughout the US, and internationally in Britain, Europe and Australasia. Length 45 mins-2 hours. “Rags, Blues, and All That Jazz!” is flexible in terms of presentation, drawing on Dr. Muir’s empathy with audiences of many types, from schoolchildren to graduate level music students and from an extensive repertoire. Each item is introduced and its historical background given which adds an extra dimension to the performance. Select items are enlivened with charming vocals. In terms of content, each program can be individually negotiated to reflect the needs of the occasion. For a jazz festival, for instance, content can be tailored to reflect a broad jazz content; similarly for ragtime or blues events. 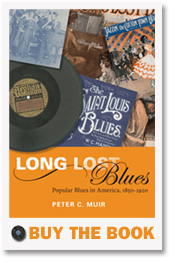 In all cases, Dr. Muir draws from his large and exceptionally interesting repertoire, ranging from his individual take on well-known traditional items such as folk blues, to long-forgotten works, the result of his extensive researches into the music of the era. Repertoire includes: instrumentals by Scott Joplin, Jelly Roll Morton, James Scott, and Fats Waller; popular songs by major songwriters such as Irving Berlin, George Gershwin, along with lesser known ones such as Isham Jones and Walter Donaldson; and a wide selection of gospel, blues and proto-blues material.